TOKYO — Strong winds from a typhoon forced air traffic controllers to temporarily abandon the control tower at Narita International Airport on Monday, shutting down one of Tokyo's two main airports for about an hour. Hundreds of domestic flights were canceled at the city's other major airport. Narita was closed at 2:20 p.m. after the controllers left the tower when wind speeds reached 126 kilometers (78 miles) per hour, said a Transport Ministry official at the airport who would give only his surname, Matsumoto. The airport reopened around an hour later. It was the first time the tower had been closed because of a typhoon. It closed once before, because of shaking during the magnitude-9.0 earthquake that triggered a massive tsunami in March 2011. 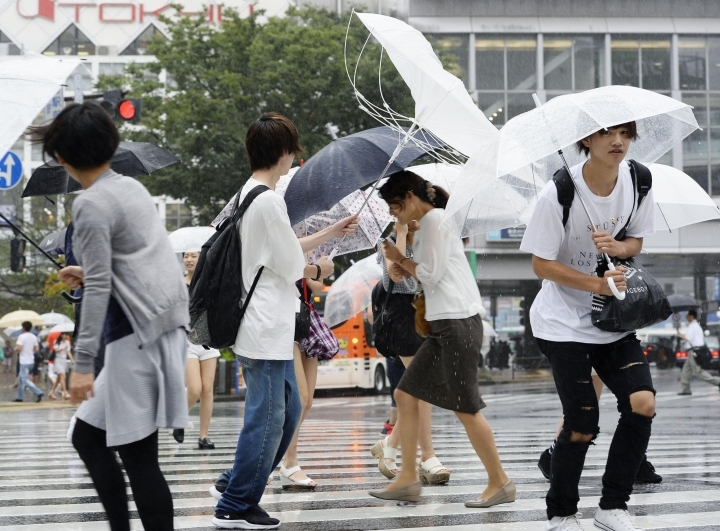 Typhoon Mindulle, which made landfall south of Tokyo early Monday afternoon, brought heavy rain and strong winds to Tokyo and surrounding areas. Eleven people were injured, three seriously, said Japan's Fire and Disaster Management Agency. South of Tokyo in Kanagawa prefecture, a woman was unconscious after being washed away on a flooded road, and another woman, in her 80s, was blown over by strong winds and seriously injured. Further southwest on the Izu Peninsula, a man in his 30s was knocked over by winds and broke a rib bone. Narita, which is located outside of Tokyo, said that 88 international and 34 domestic departures and arrivals had been canceled. More than 400 domestic flights were canceled to and from Tokyo's other major airport, Haneda. Mindulle had sustained winds of 108 kilometers per hour Monday evening, down from 126 kph when it made landfall, and gusts of up to 162 kph (100 mph). It was forecast to move north over the Tohoku region and reach Japan's northernmost main island of Hokkaido on Tuesday. Japanese television showed scattered damage around the region. One house had lost much of its roof. A train on a small commuter line in western Tokyo had to be evacuated after the earth under the tracks gave way, leaving the tracks, train and overhead lines tilted, Japanese broadcaster NHK reported. No one was injured. Heavy rains have swollen rivers, and authorities warned of the possibility of flooding and landslides.